How Holy Can My Family Be ? This Third Week of Christmas extends our reflection on the coming of our Lord among us. It is surrounded by two Sunday celebrations of epiphanies. An epiphany is a showing, a revelation, a manifestation. The day we call the Feast of the Epiphany makes use of Matthew's account of the Magi, the wise seers from the East to whom are revealed the good news of our salvation. 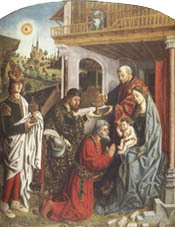 The Feast of the Baptism of the Lord represents another epiphany. When Jesus comes out of the water, which he enters to symbolize the completeness of his entry into our lives, a voice from heaven makes known to us who Jesus is: "My beloved Son." After all these years of waiting and longing, after all the promises and hopes, he is here - born into conflict, baptized in the Jordan - for us all. The other part of the process of revelation, of showing, of epiphany is the part where we observe, recognize, take it in, and receive the good news as it is given to us. When we receive the gift, the gift giving is complete. When we recognize the one revealed, the epiphany is accomplished. When we accept who God is for us in Jesus, we let the Spirit give life to our salvation. The continuing readings from the First Letter of John are perfect to grow in a sense of how loved we are and how we are called to love. The gospels this week manifest to us a Lord who is full of compassion, who feeds the hungry and heals the sick. This is a powerful way to end the Christmas season and, long after the wrapping paper is thrown away, to look back and give thanks for the real gifts we have received this year. R Lord, every nation on earth will adore you.